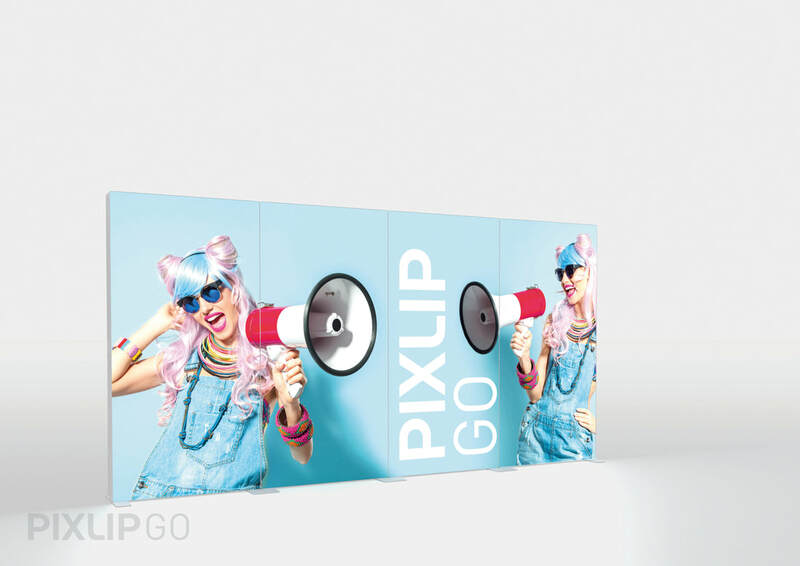 PIXLIP GO is the first mobile and illuminated presentation system made of plastic. The flexible plug-in system is based on lightweight plastic profiles covered with textile prints and backlit with integrated modules. For quick assembly and dismantling, neither tools nor previous technical knowledge are required. All components are packed in a practical carrying bag. 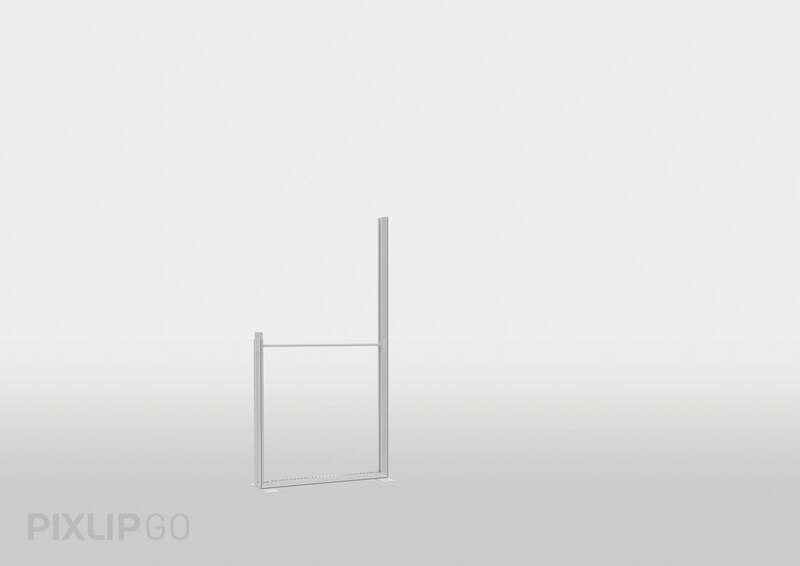 The PIXLIP GO frames are based on a simple connection system requiring neither tools nor experience. Construction is almost intuitive. The small number of construction parts simply slide perfectly into each other. Screws and other fixing elements are not required, since the friction of the plastic and the stretched textiles already provide sufficient stability for the frame. Due to the intuitive and easy handling, the frames can easily be assembled or dissembled within a minute, even by anyone without experience without the risk of injury. 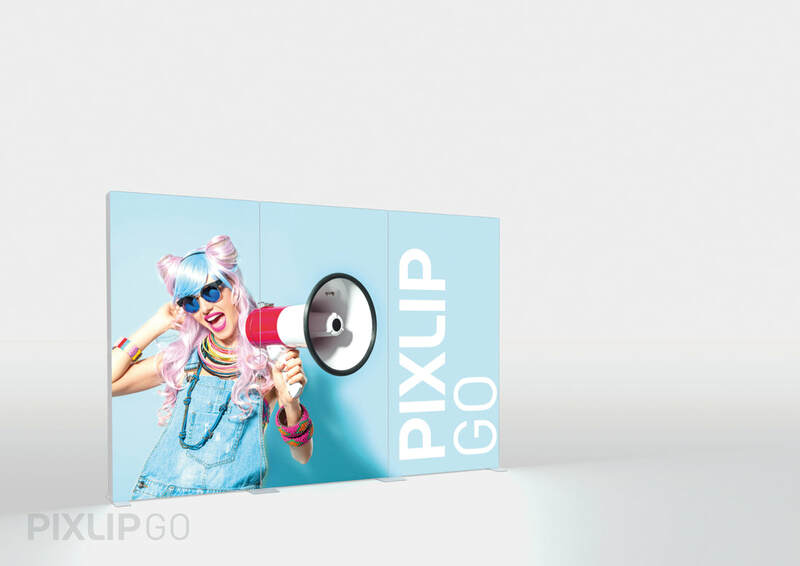 PIXLIP GO owes its long-distance effect to the integrated lighting that attracts the attention of potential customers. Thanks to the comprehensive system concept, the highly efficient LED modules are not simply screwed into the profile, but simply pushed into the profile. There they are protected from impacts and other environmental influences. 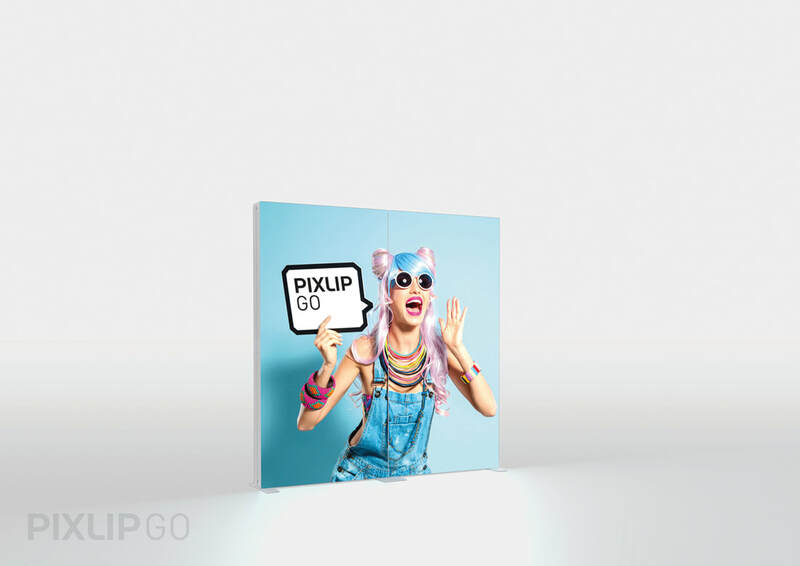 PIXLIP GO frames owe their individuality to the printed textiles. Thanks to the surrounding rubber lip, the print can simply be pressed into the matching frame groove. Even without prior experience, the front and rear sides can be fitted in minutes. The patented Print Clip, which is pre-attached to the textile, also supports this. 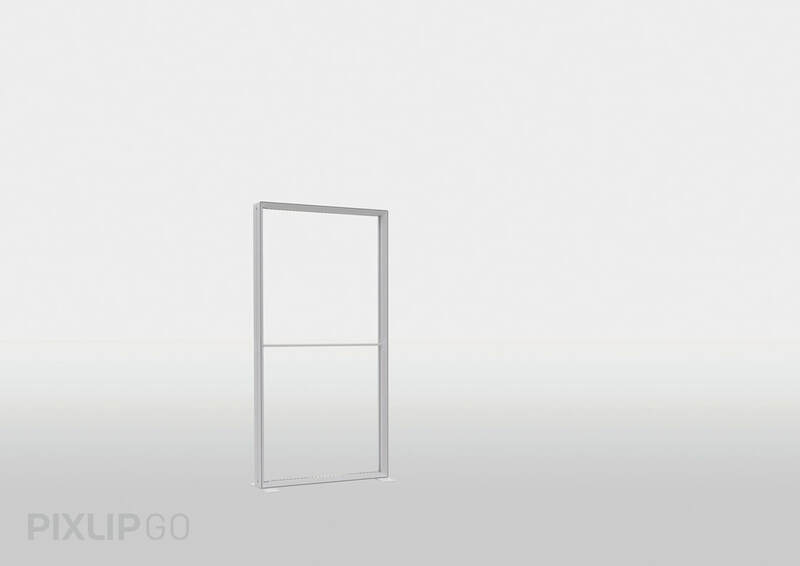 All PIXLIP GO frame products follow the overriding idea of the system and can be easily connected to each other to form walls or entire exhibition stands with the aid of the connectors. The range of accessories offers all the prerequisites for a successful company presentation. The simple plug-in system and the lightweight plastic construction not only allow a quick assembly and disassembly of the presentation area. Thanks to the light weight of the demountable components, PIXLIP GO can also be easily stowed and transported in the carrying bag supplied. 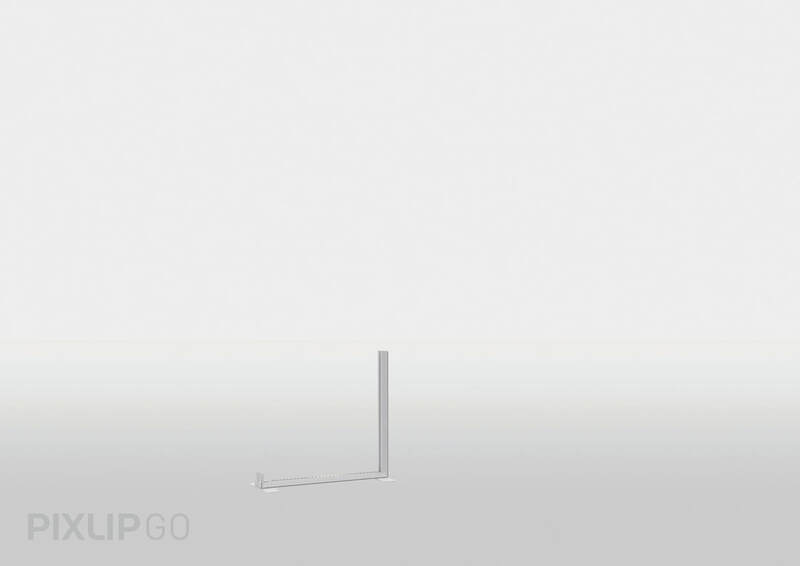 This gives PIXLIP GO its unique mobility that characterizes the product. 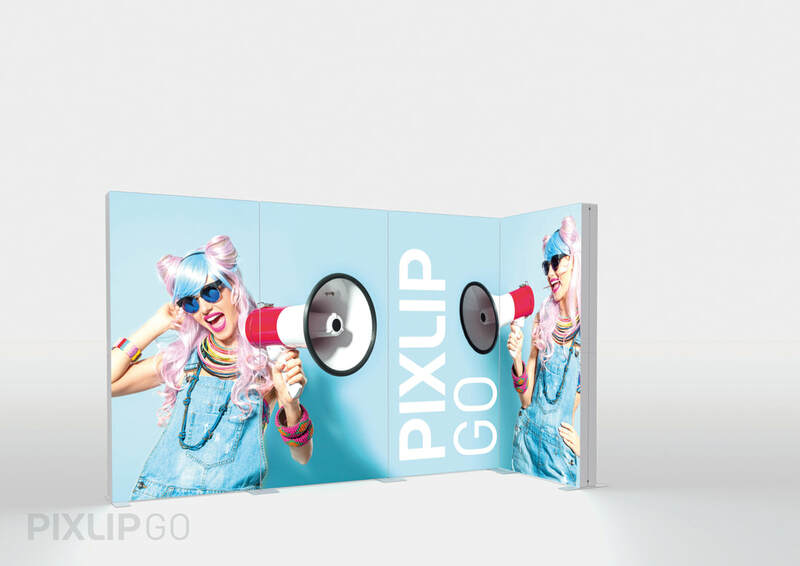 The PIXLIP GO principle is as simple as it is effective and is based on a three-part kit: the core element of the display is the lightweight plastic frame construction. The lighting is provided by powerful LED modules, the piped printed textile creates an individual advertising space. The user not only has different frame heights and a large number of practical add-on parts at his disposal, the modular system also enables the flexible connection of several frames to entire exhibition stands. Download PIXLIP catalogue for more info about the products!